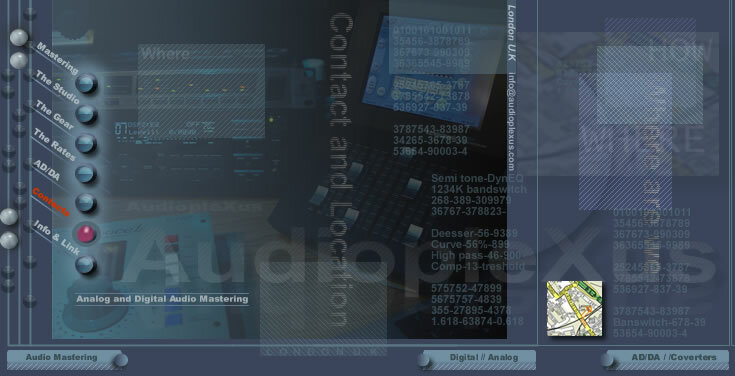 CD mastering studio, State of the art mastering studio, AudiopleXus Studio London UK. Where are we Audioplexus is located in London E3 (city) its about 20 minutes from the west end you can get there by Bus , the underground or DLR train also close to the City airport. AudiopleXus also does restoration - declicking, denoising, dehissing. Sync AD/DA - Transfer DAT to CD - 1/4" tape to CD-DVD or DAT - Stereo to 5.1. Recording to digital stereo format. High end audio mastering London UK - Photo by Owen Davies - Design & Graphics By AudiopleXus - Navcool group Plc TM All Right Reserved 2004-2012.